June is a lucky month for the Berlin zoukers: We are happy to announce a 2nd Vereinstraining on 22-24.06.2018 with two of the best Zouk teachers worldwide: Layssa and Arthur! Originally from Brazil, at the moment living in Australia, they are coming to Berlin at the end of June and you don’t want to miss this AMAZING opportunity to learn and dance with them! As always there will be workshops and parties, FREE for Dança Alegria members! Layssa and Arthur were both born Brazil and at 14 years old discovered their dance passion. They specialized in Brazilian Zouk and Samba de Gafieira. Layssa won with the company the 1st Place in the “Onda Zouk“ Competition, while Arthur was accepted in Goiás Federal University where he did Physical Education learning Human Anatomy, Biomechanics, Gymnastics and much more, instruments that he applies into his dance and teaching nowadays. In 2013 Layssa started her new career with her new dance partner, Arthur Santos. In 2015, Layssa & Arthur got their Distinguished Talent Visa in Australia, letting them reside in Adelaide, where they are building a strong Brazilian Zouk community and sharing their passion of brazilian dance by teaching and performing Brazilian Zouk, Samba de Gafieira and many other Brazilian styles of dance, traveling inter-estate around Australia and touring overseas. Coming from outside? Register online info@danca-alegria.de and pay your pass with bank transfer (up to one week before the event!) or cash by coming 15min before the beginning of the workshop. Private classes are a great way to speed up your learning process! 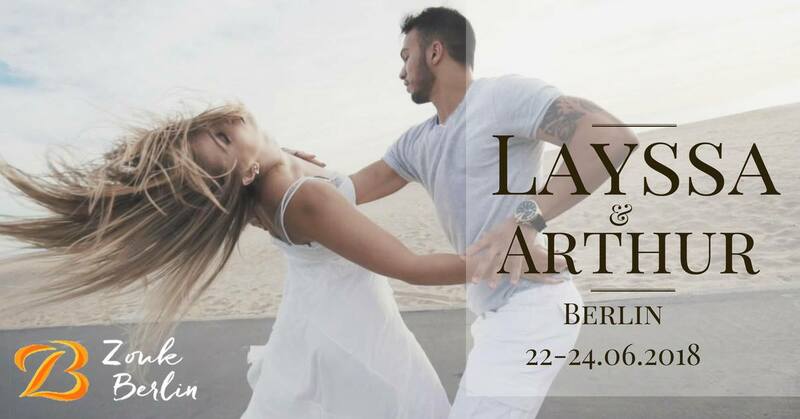 Layssa & Arthur are also available for private classes in Berlin. Contact us at info@danca-alegria.de for more information on time and prices.